Education Day at "The Joe!" 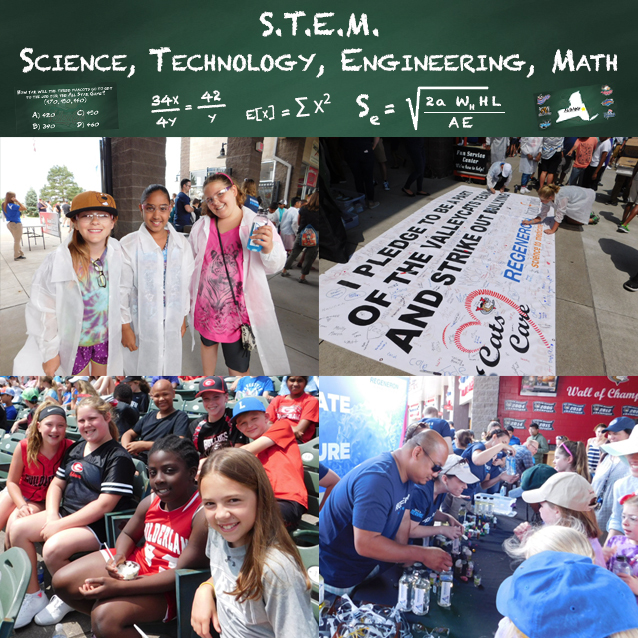 As part of their mission to "Create Fans for Life," the ValleyCats will host the youth of the Capital Region for the 5th Annual Education Day at "The Joe" on Wednesday, June 13. The 'Cats will play the Albany Dutchmen of the Perfect Game Collegiate Baseball League, with the game serving as the background to an all-encompassing educational field trip opportunity for local schools. The game will be used to demonstrate how S.T.E.M. and other academic subjects integrate with the game of baseball, while also providing a platform to educate students on anti-bullying and character development. The program includes fun activities to educate students in areas such as science, mathematics, history and geography while demonstrating their real-world applications. This includes items on the geometry and dimensions of the field, player statistics and mileage charts for travel between the various cities throughout the New York-Penn League, historical ties to baseball in the Capital Region, and more. Each year, roughly 25 schools and nearly 4,000 fans attend the game! Several local organizations have helped support these field trips for local schools, including Regeneron Pharmaceuticals and Transfinder, who have been involved since the inaugural event in 2014. The schools also learn about character development by joining SouthPaw and friends in taking an anti-bullying peace pledge before the game. Students also have an opportunity to sign the 'Cats Peace Pledge, which will be displayed at the stadium throughout the summer. While a day of baseball is always fun, it wouldn't be a ValleyCats game without the in-between inning events. Students are also randomly selected to participate in on-field games like the T-Shirt toss, Spiedie's Chicken Challenge, inflatable cow pass, Pony Hops and more! A special curriculum has been created for local schools to download and use as a precursor to the event. To learn more about how to get your school involved in Education Day at "The Joe," contact the ValleyCats front office at 518-629-CATS (2287). As we join forces with local school districts, this unique opportunity figures to be a staple for years to come!